I already tried KB2957503, but eventhough it succeeded, the log files shows a failure. I was going to go on and figure out how to get a 2003 update on x64, because my slipstream is from 2012, but I'll give 2834886 a try. If it doesn't work, my next step would be to raise the issue with Microsoft for 2003 x64 before the extended support runs out, with the hope that a possible fix can be hacked into xp x64. Please keep us informed of your progress, mockingbird. High priority update KB3011780 replaced high priority update KB2478971 and optional update KB2927811. Additional update KB3011843, released 2014/10/30. Last edited by 5eraph on Thu Feb 19, 2015 5:20 pm, edited 1 time in total. Reverted MUWeb.dll and wMUWeb.dll to r256 from v7.6.7600.257 to restore access to the Microsoft Update website. MUWeb.dll v7.6.7600.257 is working again with the Microsoft Update website. r257 will be restored in the next update pack, provided the problem doesn't recur. Last edited by 5eraph on Sun Nov 30, 2014 6:01 pm, edited 2 times in total. Updated to 2014-11_4. Please read the Changelog for full details. Last edited by 5eraph on Thu Feb 19, 2015 5:21 pm, edited 1 time in total. 5eraph wrote: Please keep us informed of your progress, mockingbird. Will do, thanks. I've made an inquiry, and my next step is to try and contact them directly. But I'll have to do it in a roundabout way for Windows 2003 x64, because xp64 is completely EOL. Forgive my ignorance, but how can I install only the 2003 updates for x64 that you've most graciously isolated and integrated after XP64 is already installed? The patched update.exe file may help to run them on XPx64. However, you'll need to read the "update_SP2?? ?.inf" file in each update to determine what requirements are necessary for each of them. For example, to install KB2518295 you'll need the Win2003 "Certificate Services" component installed or the files won't be copied. Faking it in XPx64 is beyond my expertise. I run Win2003x64 in a virtual machine to get the QFECheck registry entries that don't appear in XPx64. Updated to 2014-12_1. Please read the Changelog for full details. Hi Mr 5eraph, and thanks for your time and hard work building and packaging the XP x64 Update Pack. Can you give a new link of the last official update build version 2014-04_2 or 2014-05_1 Please? I highly need it, but unable to download it anymore. You're welcome, go-on. Welcome to the forum. Updated to 2015-01_1. Please read the Changelog for further details. The missing description strings in IE.inf were taken from IEHarden.inf. Changed default Flash Player Auto-Update behavior from Notify to Enable. The Flash addons will modify this. Updated to 2015-02_1. Please read the Changelog for full details. Additional update KB3037639 replaced high priority update KB3013455. Updated to 2015-03_1. Please read the Changelog for full details. Microsoft has three problems to tend to regarding the Microsoft Update website. The first is its bad certificate; there's no way to make it work properly. Second, the 0x80248015 error completely breaks the website. It is necessary to change the system date to 2014-11-16 to access it. And finally, the site fails to detect that KB3033395 is installed under Win2003x64. This last I believe is a problem with the update--it's missing the uniprocessor kernel file "ntoskrnl.exe". Additional update KB3039024, released 2015/03/10. 0x80248015 appears to be resolved. If it happens again I'll consider going back to muweb.dll r256 permanently since it works more consistently than r257. Took some time and found a workaround for the certificate issue. The following https URL can be used that doesn't redirect and cause the certificate error. It will be implemented in the next update pack release. The KB3033395 problem persists. It seems only Microsoft can fix it. Updated to 2015-03_2. Please read the Changelog for full details. There's still an issue with KB3033395 in Windows 2003 x64. The pack may be updated again once it's resolved. I was using the 32-bit version of Windows XP from 2002 until 2013. What usually happened with my PC's is that the 32-bit install of XP got a bit unstable over time for one reason or another, but I was always able to do a nice and easy re-install with an updated XP x86 disc with the latest addons. I tried XP x64 many years ago when it was first released, but the driver support back then did not allow all my hardware to work. Then in the beginning of 2013, I upgraded my PC and it now had 8Gb of RAM so I decided to give XP x64 another go. I found that I was now able to get drivers for all of my hardware and run XP x64 successfully. So I decided to integrate an x64 install disc using your update packs from February 2013, which I then installed. The result of that is that I have had the most stable rock solid computer ever and I have not had to reinstall Windows for over two years now. I am not averse to trying other operating systems, my PC is built with tray-less hard drive caddies, and I swap hard drives depending on what I am doing. For instance, my Steam games all run on an SSD using Windows 7 x64 and I have some specialist software on other drives that run in Windows 7 x64. I also use Windows 7 x86 at work and all of the other family computers and laptops run Windows 7 x64. I do like Windows 7, but XP x64 is like an old pair of shoes, it's just comfortable and it is my preference for my day to day computing. I am now going to replace my hard drive as it a bit old now with a less used drive, and for that I will be integrating a newer XP x64 install disc using your latest update packs. I really like the x64 version of Windows XP and by continuing to provide update packs after "End-of-life", you are enabling me to continue to enjoy an up to date XP x64 installation. Thanks for all your time and hard work in producing your update packs - it is much appreciated. 5eraph wrote: Updated to 2015-03_2. Please read the Changelog for full details. You're welcome, motokiume. My experience with XP x64 has been much the same. Moved to x64 once the drivers matured and have been happy with it ever since. High priority update KB3002657-v2 replaced high priority update KB3002657-v1. High priority update KB3033395-v2 replaced high priority updates KB2813170 and KB3033395-v1. Thanks for checking in, adric. NTOSKrnl.exe was indeed missing from v1. Kurt_Aust just alerted me to KB3046310 which should be released soon. Expect yet another pack release within the next couple days. You can read more about it on Ars Technica. Your update pack has these files somewhat outdated. And also many thanks for the best Update Pack for XP x64 ever! Thanks for the compliment, Svyat. Additional update KB940262 is superseded by high priority update KB2647170. High priority update KB969883 is superseded by high priority update KB2571621. There must be a reason Microsoft decided not to include those specific resource files in the newer updates. I'm inclined to follow their example. High priority update KB3048051 replaced high priority update KB2982792. Thanks. This issue was in the news, I was waiting for it. At this point, keeping track of the updates is becoming very confusing. I think it's a good idea to wait until 2003 becomes EOL, and then just run a Windows repair on x64 with a slipstreamed CD. I wish they'd give updates until 2019 though like they're doing with XP POS. Would be trivial for them. They already replaced KB3048051, mockingbird. For a general list of updates since XP EoL you might want to check the POSReady addon. It should be almost the same. I'll post differences between XP x86 and x64 upon request. High priority update KB3050995 replaced high priority update KB3048051. Sorry for the rapid updates, everybody. Busy month for Microsoft. Additional update KB3049874, released 2015/03/26. what update pack you work in future to post here, windows 7 or 8.1? Last edited by maur0 on Sat Apr 04, 2015 7:40 am, edited 3 times in total. But the thing is that updates are not handled the same way for Win7+ as they are in XP & 2003. I don't think there are such things as update packs for the latter OS anymore. The updates are all applied individually. bphlpt wrote: But the thing is that updates are not handled the same way for Win7+ as they are in XP & 2003. I don't think there are such things as update packs for the latter OS anymore. The updates are all applied individually. That's about all that is the same - the KB numbering system . Servicing is quite different compared to XP. If you want something similar to an update pack you will need to use different tools found elsewhere. Been thinking about what's next. I'll maintain the 32-bit IE8 and POSReady addons. Beyond that, I don't know yet. Windows 10 will be the next Windows 7/XP. adric wrote: That's about all that is the same - the KB numbering system . Servicing is quite different compared to XP. Thanks adric, that's exactly what I was trying to say. As to Win8.x+ and Win10, like Chief, I'll stick with Win7. I'll go check if the GDI update (3046306) fixes vsync. The update is for two files specifically, gdi32.dll and wgdi32.dll. I've also been considering experimenting with an old SP0 vanilla XP64 install to see if the first GDI+ had vsync issues. I should also probably check if Server 2003 x86 has it. XP doesn't. edit: Nope. Still no VSYNC. Thanks for keeping us informed, mockingbird. I'm still working on this month's updates. Well... one in particular for Win2003 that's holding up the rest of the x64 releases. Chalk it up to peculiarities between RVMi and nLite. All other updates test fine. Will post when resolved. Updated to 2015-04_1. Please read the Changelog for full details. Thanks for your continued excellent work 5eraph. Got 'em, mockingbird. Was holding out for a time zone update that disappeared. Updated to 2015-05_1. Please read the Changelog for full details. Hello. Noob here with a question. 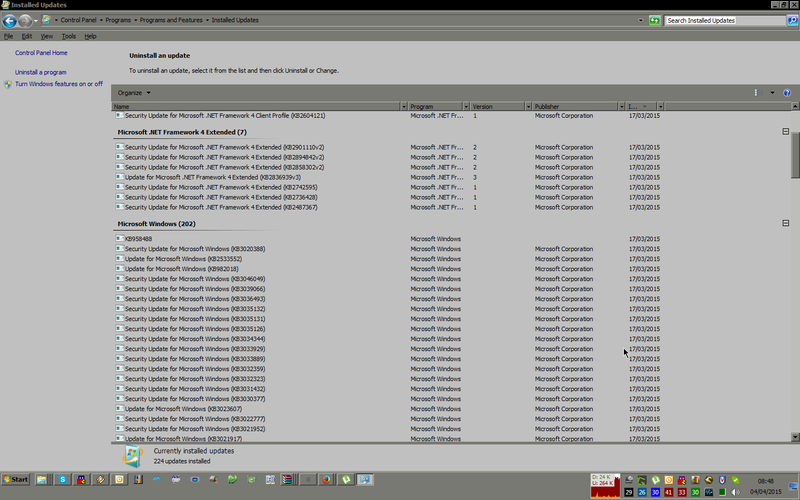 I used nLite to integrate the XP x64 update pack, IE8 add-on and Server 2003 add-on into clean Server 2003 with SP2 media. Anything I'm missing? Also: Is the Server 2003 add-on to use this update pack on Server 2003? I noticed that the actual Server 2003 update pack was from Dec. 2014. None of my releases should touch that file or its metadata in other files. I'll need to see your "Last Session.ini" and txtsetup.sif files. It would be best if you could upload them somewhere. If you'd rather email them to me then send me a PM for an address. To which "Server 2003 update pack" do you refer? Those versions of the update packs are the same ones that I have. The first couple of attempts I added the update packs to nLite simultaneously, so they weren't integrated in that order. So I tried again, this time adding them one by one in that particular order. When I boot from the resulting ISO, I get the exact same error message. All of the attempts thus far have been with x86 Server 2003. So I tried x64 Server 2003, and I have a different problem. Exact same method. Except this time I didn't add a product key, or preset the regional settings, so the unattended stage was unused. When booting from the resulting ISO in VMware, the text portion of setup hangs on "Setup is starting Windows", and does not progress further (I left it for over an hour). Sorry, the Server 2003 update pack I referred to is OnePiece's from Dec. 2014. MrMaguire wrote: All of the attempts thus far have been with x86 Server 2003. Don't know what to say about OnePiece's Win2003 update pack. Don't have a 32-bit edition to test. These x64 releases are not meant to work properly with 32-bit sources. Can't reproduce your issue with Win2003 x64. Tried R1 and R2, with and without an unattended WinNT.sif file. Don't have VMware, but installs in VirtualBox. I've run nLite in XPx64. Your "Last Session_x64.ini" indicates you run nLite in Win7. I'll try that as soon as I can. Yes, that's right. I use Windows 7 64-bit. I don't know how I ever expected a 64-bit update pack to work on a 32-bit source. Sorry about that. As for Server 2003 x64, it was R2. I didn't test it in anything other than VMware. Is there any discernible differences between R1 media and the R2 disc 1? This was tested on a real computer (Dell Precision Workstation 380). The text portion of setup went off without a hitch. The GUI portion of setup was OK at first, but then started complaining that it couldn't find lots of files. The resulting installation didn't have the functionality to open the display properties, nor did it have Internet Explorer among other components. So I dunno what happened there. I'll try and get the files for that session ASAP. From what I've read, but I could be wrong, trying to work on an XP or 2003 source, especially integrating a SP, while on a Windows 7 host, sometimes leads to problems. As a way to avoid that potential set of problems, you might try installing a basic XP in a VM, then try to make your new XP or 2003 build from within that XP VM host, making sure to match the bit-ness of the source, update pack, and other updates and addons. Just a thought. MrMaguire wrote: Is there any discernible differences between R1 media and the R2 disc 1? None that I'm aware of. I haven't looked very carefully though. MrMaguire wrote: Yes, that's right. I use Windows 7 64-bit. As bphlpt has suggested, slipstreaming an XP/2003 service pack within Vista or later can be problematic (KB950722). Microsoft gives the same advice: do it from XP/2003. This also applies when using nLite for service packs. Just tried using nLite on my laptop which runs Win7 Pro x64 SP1. Still no issues that I can find when testing in VirtualBox 4.3.28. I'll try a host install on a spare hard drive on my main PC when I can. Busy day today, so I can't promise it'll be soon. I'd be remiss if I didn't mention that your antivirus may be interfering with your integrations by locking files that are in use (svcpack.inf, addon files during unpacking, etc.). Try disabling it temporarily to use nLite. MrMaguire wrote: I didn't test it in anything other than VMware. It's been a long time since I've used VMware. I preferred VMware Server 1.0.10 due to its small install footprint compared to Server 2.x. Then they stopped supporting VMware Server altogether in favor of vSphere and I switched to VirtualBox. Haven't looked back. There's no shortage of Windows XP computers in this house, so I'll try again using one of those. I actually don't use an antivirus, so I think as nLite is concerned, I should be OK.